Welcome! Hopefully, you will find the information from this site helpful. This information is public domain and may not be resold, but feel free to use it and share it. If you want to use it in a commerical product, that is fine, just be sure to keep the metadata attached and attribute the data source as The Pineridge Group, Inc. (www.tpginc.net/gis/albania). 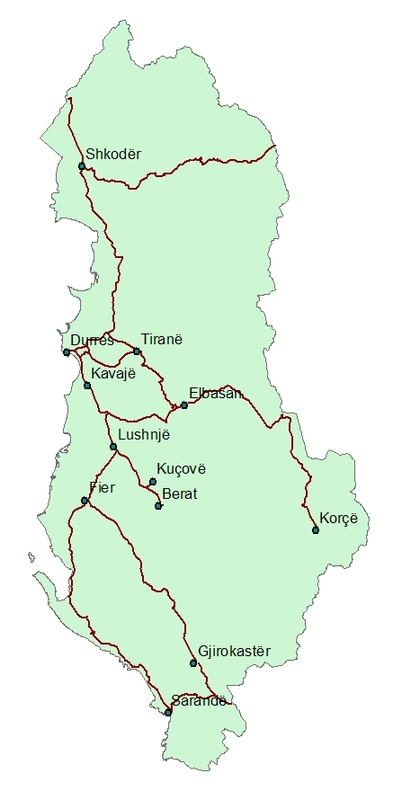 The data below has been created as part of a 2007 and 2008 project in Albania. The accuracy of the data is close enough for tourism and general navaigation to a point. IT IS NOT SURVEY QUALITY. Chose your uses wisely. Finally, if you have any udates, changes or additions for this data, please forward them in an email to the webmaster of this site. Thank you to all those G9/G10 Peace Corp volunteers who worked to collect data points and then verify the accuracy of the original data. They are David Bragg (Gjirokastra), Paul Mastin (Laç), Jerome Parker (Korça) and Criss Swaim (Durrës). A special thanks to USAID, USAID/EDEM, Packard Foundation and Peace Corps for their support in the undertaking of this project. Additional contributions since the original data was collected continues to upate and expand the GIS data available for Albania. These contributions are greatly appreciated. The data is grouped by as National, regional, then by city. As data becomes available, this table will up updated. All data is in ESRI shapefile format stored as a .zip file.